Scientific Name(s): Liriodendron tulipifera L.
Photographer(s) Appreciation: I am happy to feature a photo of the bark and leaves of the tulip tree taken by Julie Tew (aka jupitersnest@Flickr) taken in Chattahoochee, Florida. Since Liriodendron tulipifera has such fabulous flowers, this entry would not be complete without LakeOntarian@Flickr's excellent photo. Thank you Julie and LakeOntarian! I was driving along 10th avenue in Vancouver, British Columbia when my passenger, awed by by the towering tree canopy overhead, asked me which species of street tree we were seeing. I was embarrassed that I did not know the answer to her question, and set out to learn more about this species. A quick online search revealed that the trees along 10th Avenue are tulip trees, or Liriodendron tulipifera. Thankfully, I was able to find many excellent photos of this species. Liriodendron tulipifera is a large, stately tree species that can reach heights of nearly 70 meters. It has a straight trunk, self-pruning branches, and an oval growth habit. The leaf shape of Liriodendron tulipifera is unmistakable; each long-petioled leaf has four lobes separated by rounded notches. The flowers are also striking, and their tulip-like appearance gives this species its name. The flowers are greenish-yellow and have 5 petals and three sepals. Once pollinated, these give way to a cone-like structure consisting of numerous dry, winged samaras (winged achene fruit) that often remain on the tree after the leaves drop in autumn. Only one other species, Liriondendron chinensis, shares the genus. This tree species is native to the eastern deciduous forests of North America. It is the tallest hardwood species in its range. Liriodendron tulipifera had names that translated to canoewood by the First Nations peoples of eastern North America, because its long, easily-worked straight wood was ideal for the crafting of canoes. The same characteristics make Liriodendron tulipifera an important timber species today. Silviculturists also have their own names for this species: tulip balsam or yellow balsam. Margo Reynolds, in her 1976 article, Liriodendron tulipifera–Its Early Uses (PDF, and scroll down) describes some of the qualities of tulip tree wood that made it particularly prized by the early settlers of North America. Properties such as a fine, uniform grain and the ability to take both paint and varnish made this wood particularly useful for the construction of the many objects needed by the settlers. They used tulip wood to make containers and carved furniture as well as more mundane objects such as shingles and joists. The material use of Liriodendron tulipifera is interesting, but what I find even more fascinating is the symbolism associated with this tree species. In the article cited above, Reynolds remarks that the tulip tree was known as the “tree of liberty” during the American Revolution. In the time period leading up to the American Revolution, colonists would rally against the British around large, stately trees. Each of the colonies had their own liberty tree. While these liberty trees were sometimes elms (Ulmus americana) or London planes (Platanus x acerifolia), they were often tulip trees. When the British encountered these trees, they would cut them down. The last surviving liberty tree in the United States was a 400 year old Liriodendron tulipifera, located on the campus of St. John’s College in Annapolis, Maryland. A hurricane in 1999 did irreparable damage to the tree, and it was cut down during a solemn ceremony later that year. The tree lives on in the wood of 400 “liberty tree guitars” and in many seedlings that have been planted to commemorate the American Revolution (see: The Maryland Liberty Tree). Their bright yellow fall foliage against the dark trunks on a misty late October morning are absolutely spectacular. One of my favorite trees, with the added attraction of being a larval host plant for the Eastern Tiger Swallowtail butterfly. There is a hybrid between the two species , looks similar to L. chinensis except the leaves are much bigger . Have not seen it in flower so cannot comment on that . 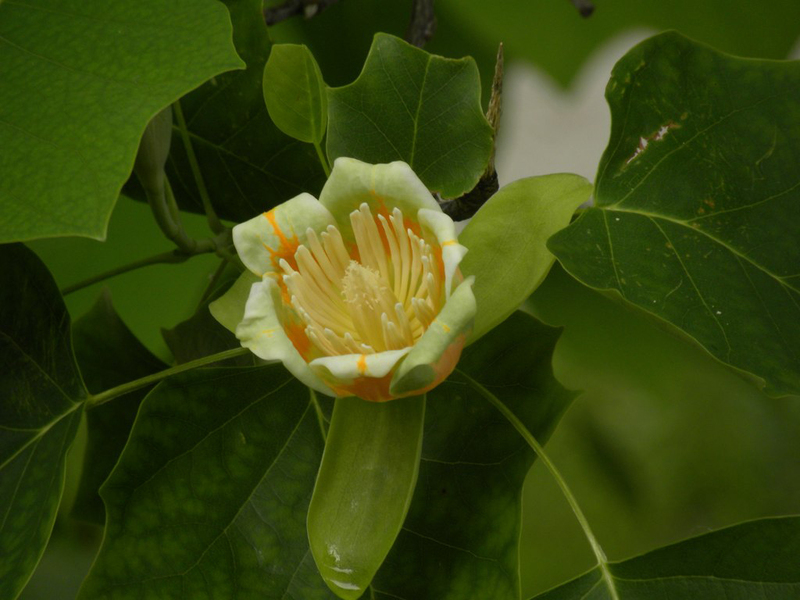 South of the border, Liriodendron tulipifera is the state tree for both Indiana and Kentucky. It was a familiar tree of my childhood in Cincinnati, at the eastern end of their shared border. At some point after I learned my state trees, Kentucky changed theirs to the Tulip Tree from Gymnocladus dioicus. With its appropriate common name of Kentucky Coffee Tree, I never much understood this decision. G. dioicus is a beautiful tree, with its fern-like bipinnately compound leaves. Perhaps the legislators that made the decision envied the relative stature of the Liriodendron. At one point, I had specimens of both species planted on my property. We had the Liriodendron tulipifera ‘Aureomarginatum’, with its striking variegated leaves. It had its roots eaten by meadow voles. A Magnolia actually, not by genus but by family and once you know that you see it at once in the flowers – the northernmost growing Magnolia in the eastern U.S. One of my favorite trees. Although the bark is not terribly distinct I always know when I enter a bottomland grove of stately columns that I have entered among the tulip poplars. 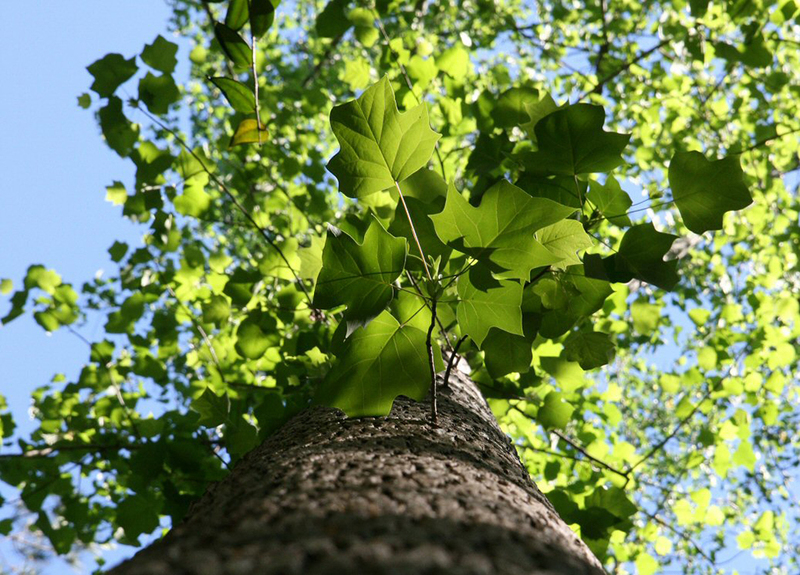 Another nickname in Tennessee is “tulip poplar.” Beautiful tree! Thanks for all your informative write-ups. Thank you, Richard, for pointing out that it is a magnolia, one that is native to the Northeast. We have an early farm table in our kitchen that was rescued on its way to the dump and lovingly restored by some great furniture lovers. They were proud to tell me that the wood is tulip tree. The table’s wood varies from light brown to dark brown to almost green, all within the same piece. Just lovely. I just took some photos of our drought-stricken liriodendron here in Seattle the other day. Currently hosting a ton of aphids, every stage of ladybug, and some bees. and turns to ashes without one need released. and couldn’t care less about your need for heat. who would be just right. who ask the honey bees to help them breed. no one burns her wood. I would love to hear one of those liberty guitars! Wonderful write-up. Thank you! My favorite tree, the topic of my Masters thesis, and the name of our beautiful dog, Tuley, short for, of course, Liriodendron tulipifera. Oh, thank you for this wonderful post about the Tulip tree. It is probably my all-time favorite tree. I can only add my love of this stately beauty to the previous posts. It’s sometimes…not often enough, imho…planted as a street tree here, in New York City. I see it from time to time in our parks and it’s unmistakeable among the woodland trees in our local forests. I adore its quirky-shaped leaves and surprisingly beautiful and complex flowers. It is beautiful in every season. Even after it drops its golden leaves, its tall elegance creates a powerful presence. And, as a beekeeper, I appreciate it as a source of forage for our girls. Thank you for the info about it being a Liberty Tree. I had never heard about that, or about the guitars that were made from that last survivor. And, many, many thanks to Paul Silvan for posting that lovely poem. That was an unexpected treat. It is always a great thrill to see one of these trees in the woods here in CT, especially its flowers, so often so high that we see the flower only when one has fallen. On West 37th Avenue in Vancouver, near Balaclava Street, there’s a house named “The Three Tulips” and outside it are three very distinctive street trees which I’ve always assumed were Liriodendron of some sort. They are very large so probably they were planted at the same time as the 10th Avenue trees. Thank you for this wonderful article, and especially the historic information. We enjoyed the shade and beauty of a mature L. tulipifera in our Portland, OR backyard for 19 years, then were thrilled when a neighbor planted one across the street from our new home eight years ago. We have the perfect view to watch that youngster mature for the next 19 years. Thank you for this lovely post. I wonder whether my 20-30 year-old tulip tree north of Montreal (Canada zone 5a) is the northernmost specimen for this species ? It grew spontaneously, doubtless from a seed in an annual flower-pot from a nursery where they were experimenting with propagating “tender” trees. It is trying to outgrow the maple beside which the seed accidentally fell, has flowered and fruited — and am keeping my fingers crossed. Love your photos and your wonderful blog. Therese, it may be a northernmost specimen in eastern Canada–we’d need others to chime in. In western Canada, it is cultivated in Powell River, so that approaches 50 degrees latitude north. There may be other sites further north than that. Yes — in Haida Gwaii, Prince Rupert and Terrace.